I had the opportunity to to do a guest designer spot over at Stamps R Us this week, they are being sponsored by Gingerloft, the theme this fortnight is shaped cards, I do love shaped cards and it gave me a good excuse to use some of my new (I treated myself) Marianne Creatables die cut shapes, the frame and the flowers are all her dies, and of course a lovely digi which i've had for a while from Gingerloft. which I coloured with good old promarkers. the base card is my favorite Centura Pearl which I always keep plenty of in my card cupboard. An unusual and very attractive card. I like the image and the shape you have choosen. Thank you for joining us at Rainbow Lady's challenge this week. This is just gorgeous Wendy, a beautiful card. Thanks for playing along with the Sweet Stampin & CES Challenges! 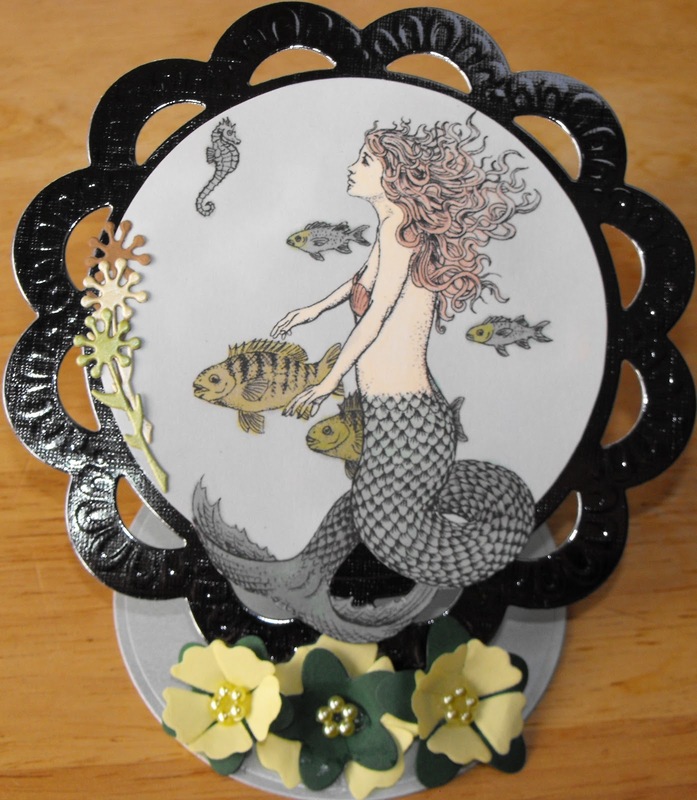 Beautiful card, love the mermaid! Thanks for joining us at PTD this week, good luck! Gorgeous! Thanks for playing along with SSD! WOW Wendy, this is gorgeous, fab image beautifully coloured and I love those dies. Thanks for joining us at Rainbow Lady's challenge. What a stunning card - that image is very mystical. I love the flowers at the bottom. That Marianne frame is gorgeous! Nice job. Thanks for joining us over at Pear Tree Designs this week - good luck in the challenges. This is really stunning! I'm loving the way you shaped her tail over the circle. I'm so happy you shared this with us at Claudia & Co. Come back soon! Thank you for playing along in our Delicious Doodles Challenge this week, and good luck! This is just adorable, new die is fabbie..
Wendy, she is beautiful, and seems the fish and sea horse are attracted to her as well. Nice layout and colors too. Thanks for sharing your card with us a the Fuzzy Wuzzy Challenge this month. Oh wow, this is lovely. Great image. Thanks for joining us over at PTD. Love the colors you combined for this card and the stamp is really great! Thanks so much for joining us at the Fuzzy Wuzzy place this week. Love everything about your card. Beautiful!! Beautiful coloring, beautiful image, and beautiful embellishments! Thank you for joining us on Card Ideas!! Wow Beautiful design and coloring. Your image is divine! Thanks so much for joining us this week at the creative card crew! Fabulous! Love the stamp and your circles too! Tomorrow is Paper Sundaes First Birthday Celebration! Come and celebrate with us! Really liked who you frame this one. Thanks for joining us Lollipop Crafts. Beautiful card Wendy!! Love the shape. Thank you so much for joining us this week at Claudia & Co!! Oh Wendy this is gorgeous! I love the shape of your card and beautiful open scallops, perfect with that darling mermaid. Thank you so much for joining us at Claudia & Co. for our shape it up challenge! What a beautifully elegant image, and your card and colour choices are lovely!! Thanks so much for sharing with us at The Fuzzy Wuzzy Challenges this month! !